The filmed competition offers as an additional way for groups to experience taking part in competition – in particular those groups for whom travelling to other venues to compete, such as the National Championships, isn’t an option. It’s an exciting chance for your vaulters, as individuals, in a team or in pairs, to really have fun and show off their skills! Please make sure you fill out the permission form as well as your entry form. 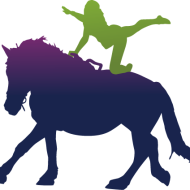 To enter please use the RDA Filmed Vaulting Competition Entry Form 2019 and the RDA vaulting permission form 2019. Video: Designed & produced by Octavia Hopwood, RDA Perry Group. With thanks to Octavia and all featured Perry Group vaulters and volunteers. Vaulting is gymnastics with a moving horse. The aim of vaulting is to improve the vaulter;s balance, co-ordination and confidence. . It is a team sport and as such promotes co-operation and team spirit. 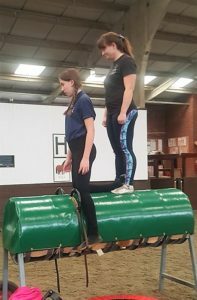 RDA Vaulting consists of a team of six vaulters, or individually working on a horse under the control of a lunger. The horses are not saddled, but wear a surcingle roller and a thick back pad. The surcingle roller has special handles which aid the vaulter in performing certain moves as well as leather loops. 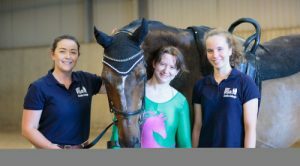 Vaulting has significant therapy benefits, you can work as a team to achieve a goal which can have a huge impact on self-confidence. Vaulting also has significant physical benefits is great discipline for improving balance, stability motor skills, flexibility and coordination. You can also work towards RDA certificates and badges, and also the National Championships at Hartpury. Please take a look at our guidance notes on the right hand side of this page.